Friday, I used my lunch break to explore downtown Charleston, West Virginia while at a convention. After a few steps, I noticed smoking was apparently the norm. Outside the back door of the hotel, there were a dozen employees talking and smoking. Walking along the street, employees were seen forfeiting minutes from their lunch break in order to get a few puffs. At each crosswalk, I could see drivers with cigarettes. In fact, one lady stole my undivided attention when she juggled a cigarette, the steering wheel, and a container of lip gloss all at the same time. If I think back long enough, I guess things used to look like that back in Michigan years ago. But, it has been awhile. With all the casualties linked to smoking and new studies and knowledge available, I could not understand how anyone could pick up such a dirty habit. Back at home, smokers are not tolerated. The University campus, most public places and workplaces, are smoke-free. Additionally, smokers are made to seem less professional, clean, healthy than the rest of the population. Butts and Guts in the beautiful historic town of Charleston. Saturday, a friend said, “I can’t believe how many smokers there are around here!” I chimed in with enthusiasm. Just as I was about to get comfortable talking about how unhealthy all the smokers were, she said, “AND…have you seen all the morbidly obese people down here with almost no healthy food options. It’s like a food desert.” She was right; there were a lot of heavy people moving in and out of the pizza, burger, and Asian food spots. I hadn’t thought of junk food on the same level as cigarettes before this, but I can’t really justify the distinction between the two. 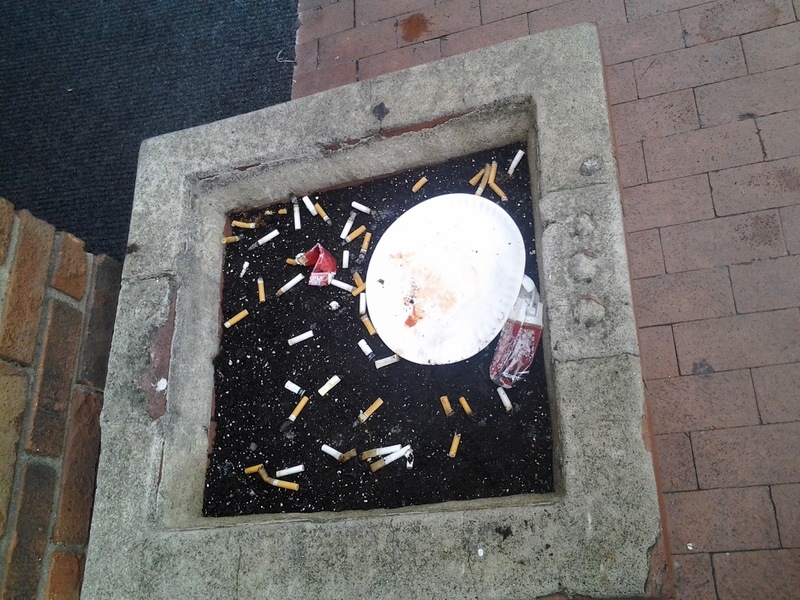 Walking along the next block, I saw a visual embodiment of my new revelation: there were several decorative containers (such as the one shown in the picture) that contained cigarette butts and discarded pizza plates. Ouch; I am so glad that I am working on decreasing my unhealthy habits! ← Slow and Steady or Complacent?